Luke Bird, a senior at NBHS, has been selected as one of only five Marine Corps JROTC cadets in the world to receive a Legion of Valor Bronze Cross for Achievement this year. He was also recently notified of his appointment to the United States Naval Academy (USNA). 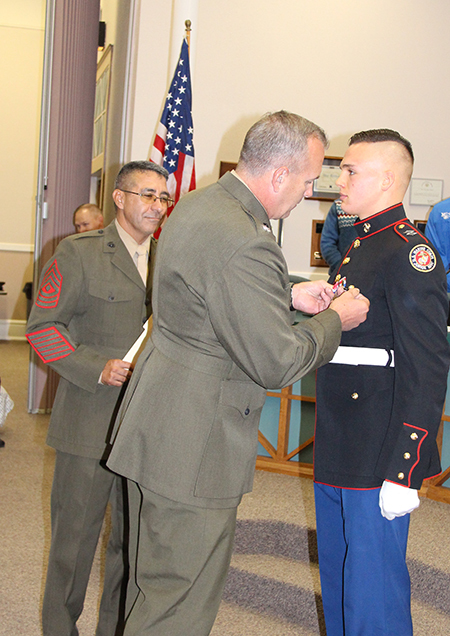 The Legion of Valor Association, through the Department of Defense and the Marine Corps, awards just five Marine Corps JROTC cadets throughout the world the Legion of Valor Bronze Cross for Achievement. The award is for outstanding achievement in both scholastic and military subjects and outstanding leadership demonstrated in both the school and community. Cadet Bird was nominated by his Marine Corps JROTC Instructors, 1stSgt Felix Acosta and Lt Col Mark House and endorsed by NBHS Principal Kara Bock for this honor. Bird received official notification of his appointment to the USNA earlier this month. The USNA is a highly competitive program that has graduated more than 81,500 men and women including one President of the United States, 24 Members of Congress, 53 Astronauts, 73 Medal of Honor Recipients and two Nobel Prize winners. He will be able to earn a four-year degree at this historic institution and a commission as an officer and leader in the United States Navy or Marine Corps. “When I received my appointment to the USNA, I started smiling and couldn't stop. I'm not the most excitable guy, so this is about as outgoing of a reaction as I've had,” said Bird. Bird has attended NBHS his entire high school career and participates in several activities. He is co-captain of the NBHS Wrestling team, Vice President of the National Honor Society, Senior Class President and Battalion Commander of the Marine Corps JROTC. He is currently ranked in the Top 10 in his class and was named a 2018-2019 National Merit Commended Scholar. After graduating from the U.S. Naval Academy, he plans to serve as an officer in the U.S. Marine Corps. He is the son of Audra Courter and Chad Bird. Luke Bird receives his 2018 Legion of Valor Bronze Cross for Achievement from his JROTC Instructor Lt.Col. Mark House as 1st Sgt. Felix Acosta looks on during a recognition ceremony held on Nov. 12, 2018 during the NBISD Board of Trustee meeting.